mmsonline.com December 2017 MMS 75 FEATURE contrast, with the new system, "there's almost nowhere I can't get a probe into," he says. "With more than 40,000 possible orientations, program- ming almost seems easy now." That's not to suggest there hasn't been a learning cur ve. Even beyond dealing with two additional axes, mounting the lengthiest stylus to the 5.5-inch-long head makes the entire appara- tus nearly 9 inches long. "That's enough to eat up your workspace," Mr. Sigler says, and motion must be plotted with par ticular care to avoid interference. Another key lesson is the value of limiting probe changes and minimizing rapid movements whenever possible. This produces time savings that may at first seem insignificant, but amplify over the course of a lot, he says. Part and probe cleanliness also has become a greater concern, he says. Debris can accumulate on scanning probes and spread from part to part, distorting the data. During particularly lengthy scanning routines, softer workpiece materials like aluminum can even build up on the probe surface. 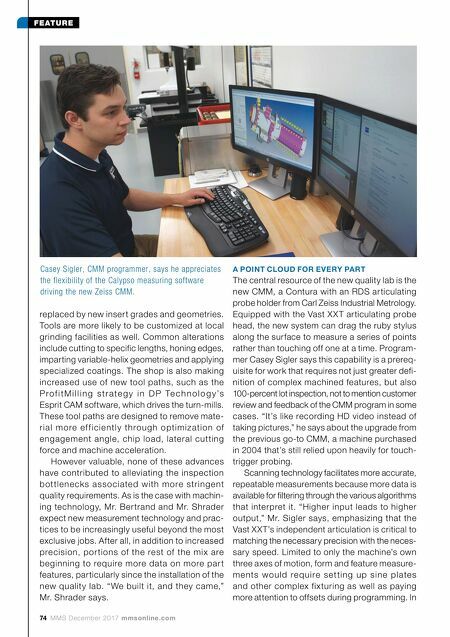 Having an extra seat of Calypso measurement software also helps avoid quality lab bottlenecks, because Mr. Sigler can program while the machine runs. He says many of the most significant time savings to date, and even some of the strategies described above, have been facilitated largely by this software's flexibility. For example, the order of operations can be changed to reduce rapid travel without fear of corrupting the program. "You can easily go from 'diameter, diameter, plane' to 'plane, diameter, diameter,'" he explains. "It treats features like wooden blocks: You can stack them up in any order you like. Take some out, move them around, and they'll still stack up." Meanwhile, automatic feature extraction from CAD models eliminates the need to manually distinguish between radii, surfaces, holes and so forth. Format-transfer capability enables cut- ting and pasting fe ature prope r tie s for e asy duplication of programmed routines (say, a pat- tern of bolt holes requiring an ID scan at a certain depth). Mr. Sigler also says he doesn't spend much time manually "filling gaps" in a point cloud. He simply specifies the density, and Calypso distributes points evenly across the measured feature (400 points over 400 degrees is typical). Arundel uses a paper- less system for tracking measuring equipment usage and calibration data. 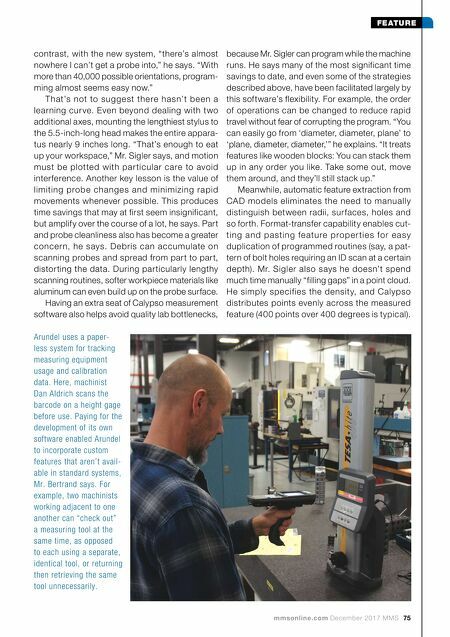 Here, machinist Dan Aldrich scans the barcode on a height gage before use. Paying for the development of its own software enabled Arundel to incorporate custom features that aren't avail- able in standard systems, Mr. Bertrand says. For example, two machinists working adjacent to one another can "check out" a measuring tool at the same time, as opposed to each using a separate, identical tool, or returning then retrieving the same tool unnecessarily.